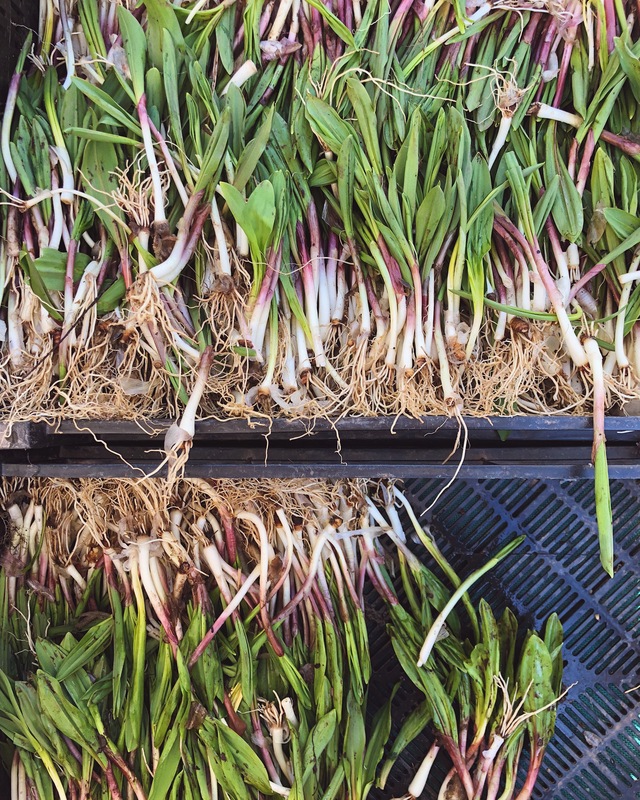 After a long and cold winter, ramps are the silver lining that spring is here. Only available for about 3 weeks of the year, disappearing once the weather gets hot, they need to be hunted down and enjoyed quickly. Also known as wild leeks, ramps really are their own unique flavour. They are sweet like a leek and pungent like garlic. Your best bet to finding them is by heading to your local farmer’s market or a high-end speciality grocery store. At around $20 a pound, they don’t come cheap, but they are to be enjoyed as a treat from Mother Nature. 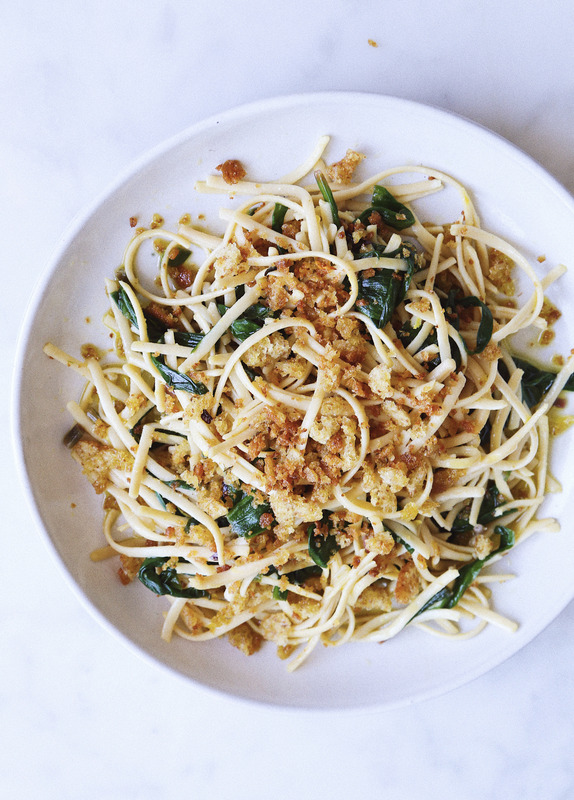 This pasta is a beautiful way to enjoy your ramps. It’s simple and celebrates ramps wonderful flavour. I make this pasta gluten-free. I use Banza pasta which is made from chickpea flour. It’s high in protein, has a great texture, and taste like regular pasta. Unlike flour pasta, gluten-free alternatives often require for you to drain and rinse the pasta in cold water to remove excess starchiness. For this reason, if using a gluten-free pasta, cook and rinse the noodles before you prepare your sauce, so you can have it ready to go. The breadcrumbs in this recipe can be optional. It’s tasty without them but more indulgent with them. I use Trader Joe’s whole grain bread. If the bread is still fresh, you can leave it out overnight to dry out. Alternatively, you can also toast the bread dry in the oven at 350ºF for 20 minutes. If you love spice, add 2 pinches of chilli flakes to the crumbs. You will notice that this recipe is not vegan because I use grass-fed ghee. When I do choose to use animal products, I always source the highest quality and I research to ensure the company is humane. For this recipe I used Fourth & Heart’ Ghee Butter -Himalayan Pink Salt. Ghee gives the pasta that delicious buttery flavour. It’s also a great source of healthy fats and vitamins. Feel free to use 1-2 tablespoons of olive oil in its place. Divide the white bulbs and the greens of the ramps. Thinly slice the ramp bulbs and slice the greens into 2" inch pieces. Heat a large skillet over medium-high with olive oil and cook the ramp bulbs until tender, about 4 minutes. Season with salt. Add the ramp leaves and sauté until wilted Add the lemon juice, zest, ghee and the pasta. Toss until coated and ghee is melted. Top with bread crumbs and serve hot! In a food processor, process bread into coarse crumbs. Measure out 1 cup. Toss the the cup of bread crumbs with olive oil, sea salt, and chili flakes. In a skillet over medium heat, toast the bread crumbs until crispy and golden. Remove from heat and set aside for recipe use. This entry was posted in Main Dishes and tagged farmers market, gluten-free, lemon, lemons, local, organic, ramps, spring, whole foods, wild leeks. Bookmark the permalink.